The Door: Sentinel of journalistic history, barrier to the commode. As expected, the lull in attention from major news outlets seeking an exclusive on The Door didn’t last. Morley Safer has resumed faxing images of his rear, which were mistaken for amateur photos of the moon’s surface until Misty, our front office person, noted that the moon doesn’t have trees. And now that his back has recovered from lifting a Sparkletts water bottle while disguised as delivery man in order to gain access to our newsroom, Keith Morrison has returned to his old tricks; today, he dressed as a meter reader for the local power company and blew the main breaker when his hidden camera fell into the power box. Because of this kind of intense pressure, I was forced to leave the newsroom and post this week’s edition of The Door (of Shame, Blame and Brilliance) after business hours and away from the office at an undisclosed bar location. 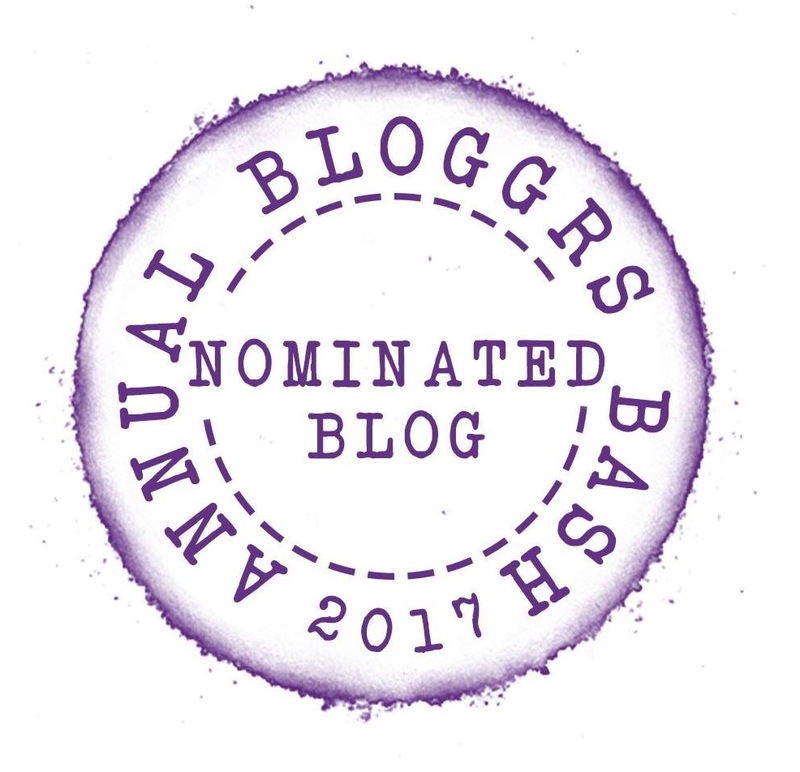 Why the sudden resurgence in media attention? 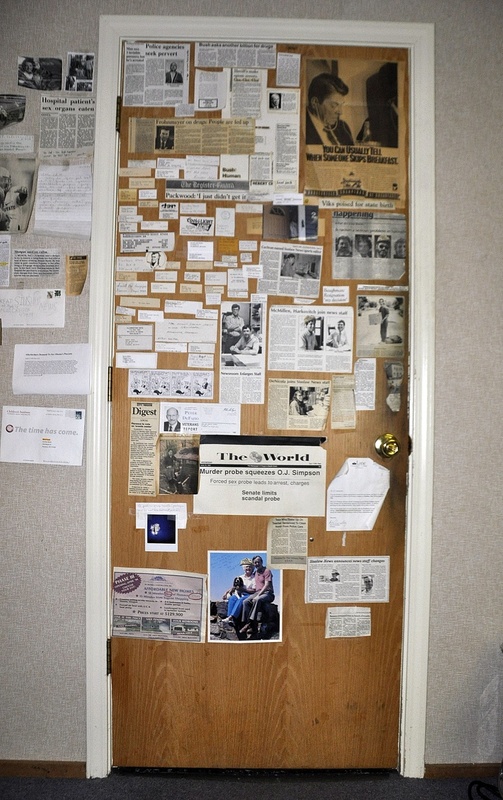 I mean in addition to the fact that The Door is home to the best and worst examples of journalism since reporters at Siuslaw News began taping clippings to The Door nearly four decades ago in an effort to preserve journalistic history while simultaneously insulating the bathroom door? For the same reason Barbara Walters left a threatening message calling me a “Diswespectful Wittle Bwat” on my voicemail: Because word got out that today is going to be special. Today, we will be adding a piece of history to The Door. In my 15 years at Siuslaw News, this has only happened three times. And not just because we ran out of tape in the mid-1980s. 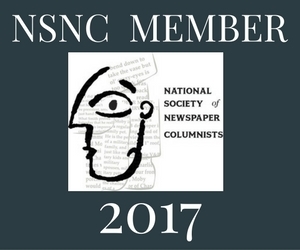 It’s mostly because we are extremely selective about what makes it onto The Door, not counting when someone sneezes in the newsroom. Now — Time to make history! 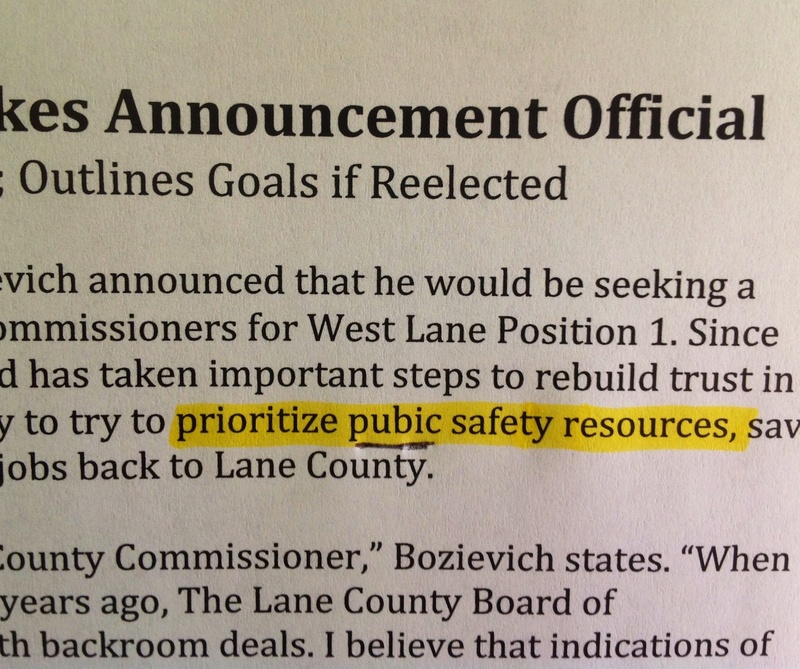 In his letter, Jay Bozievich announces his plan to run for reelection as Lane County Commissioner. And after reading the first paragraph, I doubt he’ll have any trouble with that. 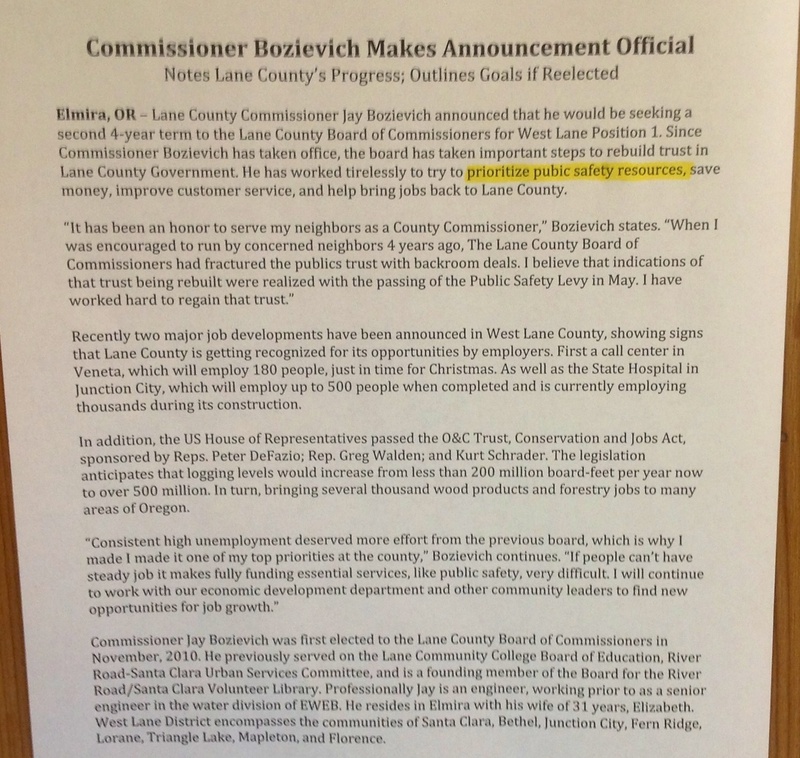 In his letter, Commish Bozievich says that since his election four years ago he has “…taken important steps to rebuild trust in county government..” and “…worked tirelessly to…” WHAT?!? Given that Miley Cyrus is now touring the U.S., with three stops in Oregon, a strong stance on “Pubic Safety Resources” could be a powerful platform. Jay, you’ve got my vote. The – Door – is – a – beac – on – draw – ing – us – into – the -curly – locks – of – journalism. Looks like he is really combing the constituency for votes. I think he’s got it sewn up. Let’s all hope that he doesn’t have a close shave.. and that Miley does. An excellent report. Tell me, have you ever considered working for the NSA under the DORD? We should talk. Tomorrow (Friday) I will post a report from Bend Oregon where I’ve been watching the Ron Burgundy Campaign for President in 2016. I think it could be a candidate for The Door. Sounds like my kind of place! I’ll definitely look for your post tomorrow. What does it say about me that I had to read that about five times before I saw the error?!? a chastity belt in every pot?